Myths give articulation to the heart and soul; they can act as guides within the lives of both ancient and modern people. 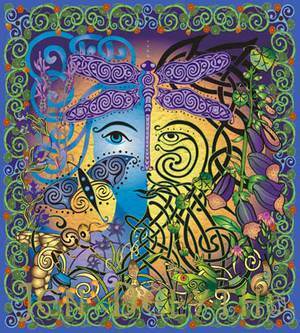 The Celtic Folk-Soul is informed by the Western Tradition. The story begins with the Hunter Gatherers, the mystery deepening during the time of the Great Megalith Builders. With the brilliant warrior tribes of Europe, the mythic narrative is manifest in a vibrant outpouring throughout every aspect of daily life. The journey continues through the remote Monasteries of the early Celtic Church, to thrive within a renaissance of Celtic culture that continues to develop through art, poetry and mythology to fuel our imaginations today. This is a living tradition with ancient roots reaching back to the first people. As a fluid and yet strongly characteristic style, Celtic art continues to change and develop – most important to those who continue to adapt and keep the tradition alive. Original artwork by Jen Delyth focus' on inspirational concepts, which while essential within the Celtic tradition, also speak to us today. Most of this artwork is conceived through the eyes of a contemporary artist. When discussing the arts and crafts of history, a few reproduction illustrations are included that are representative of Celtic works of antiquity, but all other pieces are original. I grew up in Wales, where the language itself is ancient, where indeed many of our places – river, lake and mountain – still have the living folk memory known to them, often connected to their names. Although the Old Ways and communities that kept this knowledge for many centuries have changed in the modern world, some of the ancient artwork, poetry and folklore remain to inspire us. Creativity and insight are the gifts of the Aois Dana, the Poets who guard the fountain of knowledge. The Celts honored their poets and bards, their artists and storytellers as the keepers of memories. It is they who manifest the essential wisdom of the tribe, which is woven through their complex tales and tellings. Celtic art, music, poetry and dance – the spoken languages themselves, reflect this creative, organic form – the intertwining expressions of the Folk-Soul. We will never know exactly what our ancestors thought, believed or experienced in their time, as they would not comprehend much of what we have become. Wemay seek different insights within the compelling tales and visions from those intended by the ancient folk who fashioned them; however, it is this very richness of organic imagery and abstract allusion that continues to create new meaning.